Cincinnati’s relationship with it’s riverfront on the Ohio River is remarkably similar, if not identical, to St. Louis’s relationship with it’s riverfront on the Mississippi River. Namely, each city’s downtown is separated from its riverfront by an interstate highway. Cincinnati is divided from its riverfront by I-71/Fort Washington Way. Interstate 71 is the highway barrier in Cincinnati. To the east, I-75 and a swath of railroads form a giant wall blocking the growth of downtown in that direction. A bending Ohio River, I-71, and a line of bluffs frame the east side of downtown. St. Louis is divided from its riverfront by I-70/Memorial Dr.
Interstate 70 is the highway barrier in St. Louis. To the south, I-64 and a swath of railroads form a giant wall blocking the growth of downtown in that direction. The superblock composed of the convention center and Edward Jones Dome frames the north side of downtown. Between I-64 and Washington Ave, a span of about 3,500 feet, there are presently only 5 streets that cross I-70 from downtown St. Louis to the Arch grounds and the riverfront. 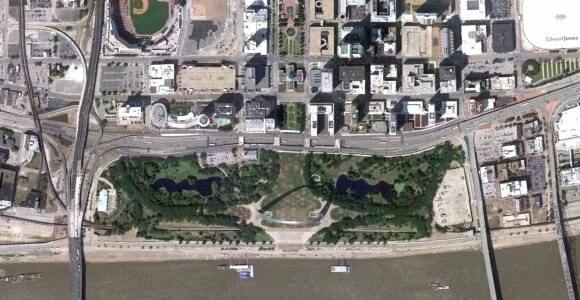 However, if the current plan from City+Arch+River for the renewal of the Arch grounds gets built, the number of connections between the park and downtown will be reduced by 1 to only 4 streets. Between I-75 and the Taylor-Southgate Bridge/Broadway, a span of about 3,700 feet, there are 8 connections that cross I-71 between downtown Cincinnati and the neighborhoods, stadia and riverfront to its south. These connections are a vast improvement over the conditions that existed prior to the complete reconstruction of I-71/Fort Washington Way in 2000. 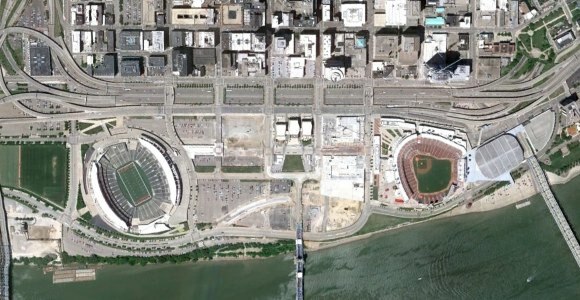 Since then, Cincinnati has embarked on the development of a mixed-use project on land between Paul Brown Stadium and Great American Ballpark. Cincinnati has and continues to take full advantage of the connections it has across its land dividing highway. St. Louis, meanwhile, seems hell bent on removing the few connections it has left with its riverfront. Ben, as can be seen in this aerial from 1993, Cincinnati’s riverfront was awful. It appears that it was just as “accessible” as it is today, but why would you ever go there? When it was first built, Fort Washington Way had more entrance and exit ramps per mile than any highway in the country. Other than a superficial aerial resemblance of the two projects, this is like comparing apples and oranges. That is not to say the Cincinnati project is not to be commended…a somewhat closer look at what’s involved via the Small Riverfront Park web site (recommended) shows some very attractive features. In Cincinnati, they seek to compare their project with Chicago’s Millennium Park, again an apples and oranges exercise. Best we celebrate each city’s answer to their respective and unique circumstances, rather than to seek to mimic one after another.